Archadeck of Columbus wants to know: Have you joined the hardscape revolution? Which group are you in? Over the past several years we have seen homeowners spending more and more time outdoors on their patios. That trend is not going to wind down any time soon. The kind of custom-designed hardscape outdoor living environment we build will never go out of style. People just enjoy them too much! If you have one, you know: the paver patio is a thing of beauty. The artful arrangement of smooth, cool stones beckons you outdoors. The effect is almost hypnotic. There is nowhere else you would rather relax — or entertain — than there. The patio is an extension of your home, and it may be your favorite part of the home. Is your hardscape environment complete? Perhaps as you enjoy entertaining outdoors, you notice there is never enough seating. Have you thought about adding a seating wall? Archadeck of Columbus can rim the patio with a low wall and top it with round-edged stones comfortable for seating. Supplementing your chairs with a seating wall keeps the patio from looking cluttered with too much furniture. You won’t need to bring additional chairs outside; the seating wall is always there. Maybe an outdoor kitchen is the best accompaniment for your patio? If you enjoy dining outdoors, it may be time to expand the paver patio to accommodate an outdoor kitchen. The chef and bartender in the family can enjoy more time with the guests without having to run back and forth into the house for food and beverages. Or, what about a fire pit or free-standing fireplace to take the chill off of cooler evenings? It may be time to elevate your outdoor living game, and it’s definitely time to begin planning for fall. Would your patio look better with built-in stone planters, decorative pillars or lighting for safety or ambiance? 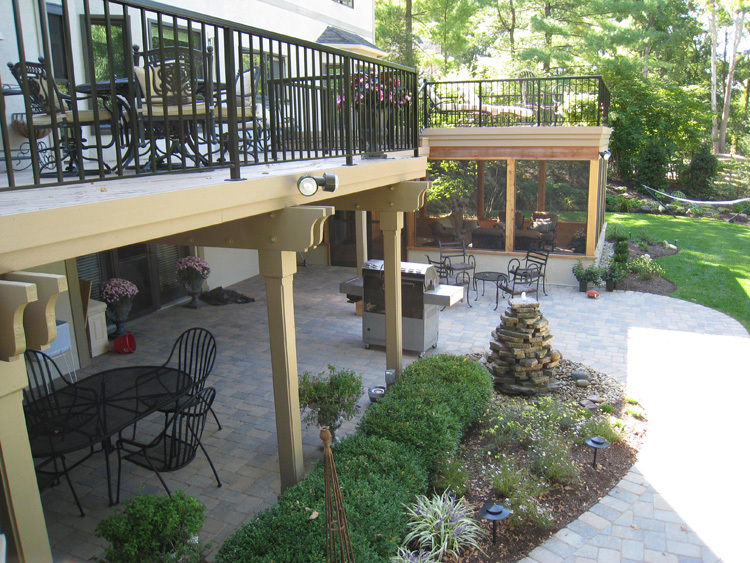 We can easily add amenities to an existing patio to enhance your enjoyment of time spent outdoors. While a basic concrete slab patio is functional, it is uninspiring and usually too small. 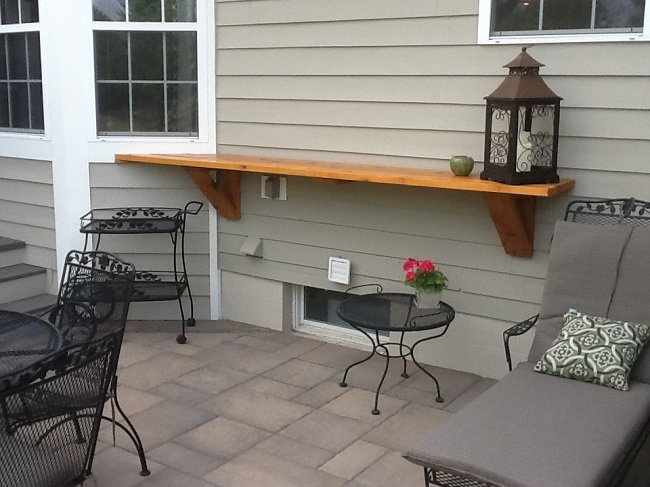 Are you still entertaining guests on the builder-grade patio that came with your home? If so, you are more than ready for a custom-designed hardscape to replace that slab. We can meet with you to nurture your vision of how a bigger and better patio would suit your family’s lifestyle. We can help you to stop seeing only what is there now and start seeing what could be there. Take a look at the before and after. They are different angles but we promise, this is the same house! We have designed a variety of hardscapes in the Columbus area and can work with you to select the materials and design elements that will work with your budget. Maybe you want to go “all out” with a stone fireplace and a full outdoor kitchen, or perhaps you would prefer to start small and add more space and amenities later (see above). With our phased building program, we can create a design for your long-term plan and then build it in stages as your budget permits. If your home is patio free, you don’t know what you’re missing! Or, if you’ve enjoyed socializing at a friend’s home with a hardscape outdoor living space, maybe you do know! Either way, you need to call us and get started as soon as you can. Don’t let another summer or fall pass without being able to enjoy relaxing, gardening or entertaining on your own paver patio. Time spent outdoors with friends and family is precious, and an attractive and comfortable patio can help you enjoy it to the fullest. The stone or concrete pavers available today are amazingly beautiful and durable. It’s no surprise that pavers are the most popular choice for homeowners in the Columbus area who are considering a new patio or hardscape. What’s more, Archadeck of Columbus can design a hardscape environment around the size and shape of your outdoor furnishings so all elements are coordinated and the end result exudes harmony. If you are having trouble picturing a hardscape design that would best complement your outdoor furniture, we can create an architectural rendering including the furniture to help you achieve your vision. 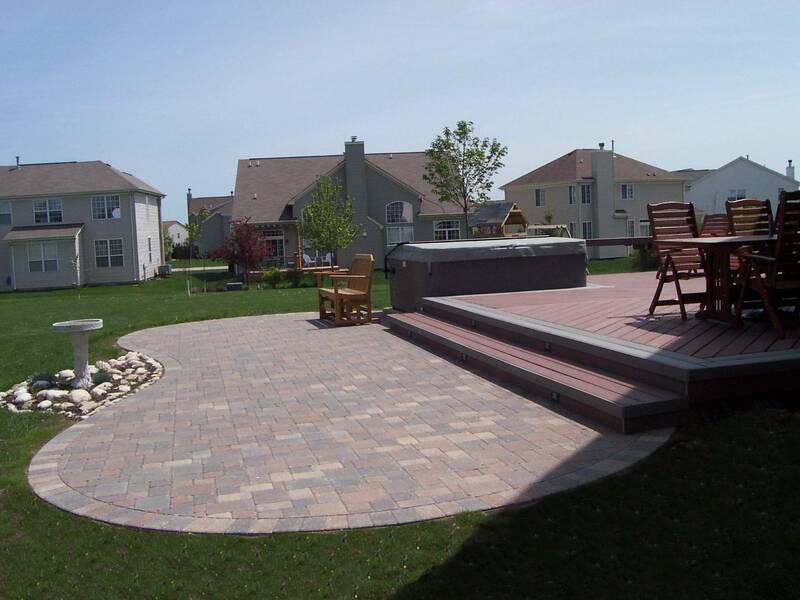 Contact Archadeck of Columbus today to learn more about creating the right hardscape outdoor living space for your family. You can reach us at (740) 879 – 3730, or email us at westcolumbus@archadeck.net. Author archadeckofcolumbusPosted on July 19, 2017 Categories Archadeck of Columbus, Columbus staged or phased building program, Hardscape designs, Hardscapes, Outdoor Kitchens, Outdoor living, Patio and Hardscape Restoration Service, Patios & hardscapes, Paver Patio Design and Installation, Paver Patio Design and Installation Columbus Oh, Paver PatiosTags Archadeck of Columbus, Columbus OH Patio Designs, Columbus OH patio ideas, Columbus OH Paver Patios, Columbus Patio builder, Design Excellence Award Winning Columbus Hardscape, outdoor living, Patios & hardscapes, paver patios, Paver patios Columbus, Plain City OH deck and patio builder, Sunbury OH Patio and Deck CombinationLeave a comment on Archadeck of Columbus wants to know: Have you joined the hardscape revolution? One of the favorite cliches of Oscar season is a famous actor or director telling the audience how special it is to be chosen for such a prestigious award by his peers. Cliche or not, that’s the kind of pride that we felt when Archadeck of West Columbus won the award for Excellence in Hardscapes and Patios in a recent competition that included companies from across the U.S. and Canada. I believe one of the things that makes this particular Columbus curvilinear patio design special is that it has all of the elements in it. The extensive stonework across multiple levels covers the earth category. We see fire both in the warming conversational-friendly fire pit and the built-in grill area with granite counters. The open air porch invites cooling breezes all summer long. Where is the water? There is no water per se, but take a look at the overall design and you will see the curving, bending nature of the lines and circles that is inspired by the winding paths of the rivers that are such treasures to us here in central Ohio. This is a project that will continue to grow more beautiful over the next few years. There are a number of landscaped areas within the design that will fill in over the long term. Those are intermingled with beds and planters that are well-suited to the use of annuals to create pops of color and interest. I can’t wait to see what furnishings the homeowner adds now that all the pieces have come together. If you’re thinking about adding an outdoor living space to your Columbus backyard, give us a call to see how we can make creating your dream backyard an enjoyable experience, start to finish. The consultation is completely free. Call (740) 879 – 3730, email us at westcolumbus@archadeck.net or visit our website at columbus.archadeck.com. We look forward to connecting with you. When Plan B stands for Beautiful! Existing deck before Archadeck of Columbus began 3-season room addition. 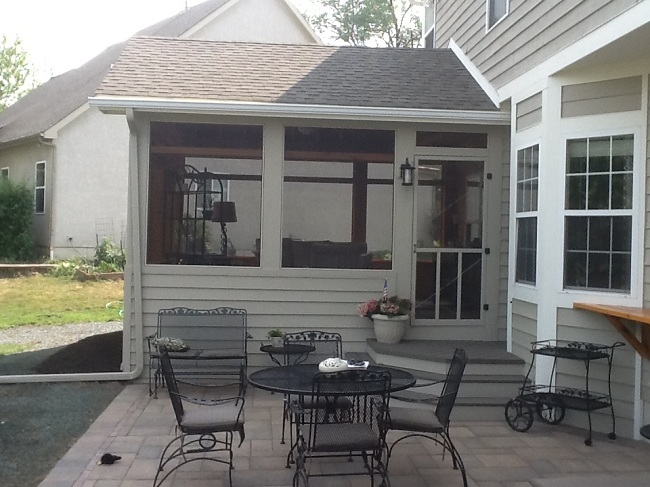 Our clients had hoped to build their Dublin 3-season room on the structure of an existing deck that was in disrepair. This was certainly a great idea and a cost-savings tool that we use on many of our redecking and upgrade projects. Unfortunately, in this case, we found during our professional inspection that the foundation was not strong enough to use. And so we went with Plan B. While it is always nice to save some money, pulling out an unsound foundation offers a few benefits. First, and most importantly, you are looking out for the safety of your family and everyone else who visits the new room. Second, it frequently gives you some additional longevity on your project, whether it is a Columbus screened porch, 3-season or sunroom. 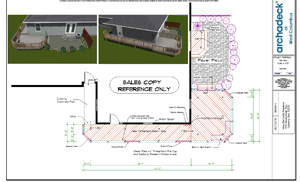 Replacing the foundation also gives you extra flexibility when it comes to deciding on the “footprint” of the project. You can expand or alter the shape from your original deck easily when starting from scratch. Interior of Dublin, OH, 3-season room. Screened porches are the center of much of the social activity in this neighborhood, so when our customers were ready for an upgrade they had a good idea of what they wanted. Their ideal space was a 3-season room that has both screens and windows so that they can enjoy the space nearly every day of the year. They chose Jeld-Wen Low-E windows which are extremely energy efficient and will save them money in the long term. They also wanted hardwood flooring to give the room a rustic feel. Interior of Dublin, OH, 3-season room showing king truss detail. Archadeck enhanced the rustic theme with cedar wrap and trim, as well as exposed tongue & groove wood on the ceiling and interior walls. The decorative king truss is a thing of beauty. It’s a stunning visual focal point for the entire room. From the outside you will see vinyl siding installed to match the existing home with cedar trim that will weather beautifully over time. Deckorators made the balusters for the exterior railing. This three season room and patio prove that plan B can stand for beautiful! Because we were starting essentially with a clean slate, Archadeck of Columbus was also able to install a curved Unilock paver patio for eating or barbecuing. In one fell swoop this family traded one tired deck for a 3-season room-paver patio combination that will be the hot new place to visit and socialize in the neighborhood this spring, summer, and fall. Author archadeckofcolumbusPosted on March 16, 2016 March 16, 2016 Categories 3 and 4 season rooms, Archadeck of Columbus, Combination outdoor structures design, Outdoor living, Outdoor Rooms, Patios & hardscapesTags Archadeck of Columbus, Deckorators balusters, Dublin OH outdoor living combinations, Dublin OH outdoor rooms, Dublin OH porch builder, Dublin OH three season room builder, Jeld-Wen low E windows, outdoor living, Patios & hardscapes, Unilock PaversLeave a comment on When Plan B stands for Beautiful! An outdoor living combination structure design will improve your home, your backyard and your lifestyle. Archadeck of Columbus spotlights a recent project in Dublin, OH that features a cedar screen porch and paver patio extension and renovation. The new space functions as an outdoor living and dining room space, and so much more. A beautiful screened porch and large paver patio makes up this wonderful outdoor combination in Dublin, OH. Many times adding on a combination outdoor living area that consists of a few well planned outdoor structures can equal the same enjoyment as adding a few room additions to your home. Having multiple living and entertaining areas to work with will increase the time you spend outdoors and increase the degree of function your backyard provides. No details was spared in this combo. structure, we even constructed a ledge the homeowner later stained in cedar to match the screen porch. The ledge makes the perfect serving area with the ample dining room on the patio. We recently completed a project in Dublin, Ohio that included a custom screen porch addition and an extension of an existing hardscape patio. The area we added to the patio enables the space to function as two separate outdoor living areas. From the screened porch we also added a beautiful landing with a unique angled stairway that leads down into the patio. The increase in the size of the patio enables the homeowners to have two distinct areas for dining and entertaining and there is even ample enough space to comfortably facilitate two outdoor dining tables with chairs. Did someone say the perfect space for an outdoor dinner party this summer? Watch the video of the completed project and see the ultimate outdoor living space come to life. The screened porch has an open gable roof design that ties into the existing home perfectly. The interior of the screen porch was built using rustic, aromatic cedar. The ceiling boasts cedar exposed rafters, large 12 x 12 roof columns and elegant transoms over the windows that are usually only seen in interior building. We also included a 24 inch knee wall made of tongue and groove cedar. The king truss is visually interesting and also serves weight function requirements due to the 2nd story cantilever. 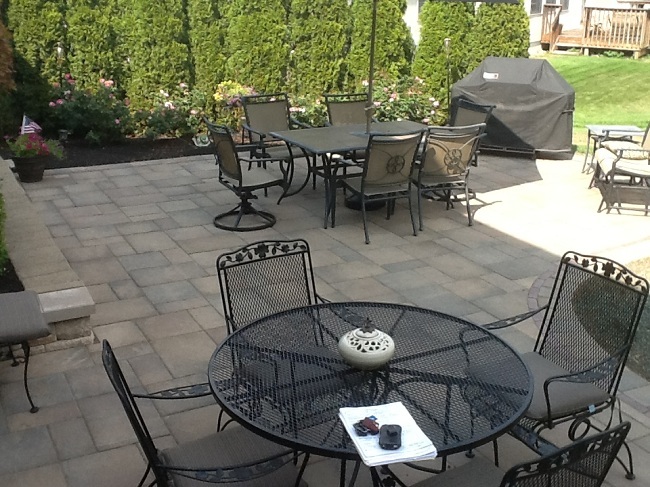 The newly extended paver patio is big on style and plenty of room for entertaining. The extension on the patio included increasing the radius of the area, and replacement of patio materials. We used Unilock Beacon Hill flagstone pavers with a soldier course edge and tied in a gorgeous ribbon in complimentary hues. We also extended the existing hardscape retaining wall and built a bar ledge that the customer had stained to match the cedar used on the screen porch interior. See more inspiring ideas on structures you can incorporate into your ideal combination outdoor space by visiting our deck gallery, our patio and hardscape gallery and our screened porch gallery located on our website. Author archadeckofcolumbusPosted on August 8, 2012 August 8, 2012 Categories Combination outdoor structures design, Patios & hardscapes, Screen PorchesTags Archadeck of Columbus, Dublin OH cedar screen porches, Dublin OH combination outdoor living spaces, Dublin OH outdoor living structures, Dublin OH patio and screen porch combinations, Dublin OH paver patios, Dublin OH screened porches, Dublin OH Unilock paver patios, outdoor living, Patios & hardscapes, Rustic Screen Porches, Screen Porches Columbus Ohio, Unilock Beacon Hill Flagstone pavers, Unilock PaversLeave a comment on An outdoor living combination structure design will improve your home, your backyard and your lifestyle. Our own design and installation expert, Rob Mitchell, discusses the elements of creating a memorable outdoor structure, or combination of outdoor structures, in your backyard. This patio, deck and fire pit combination in Dublin, OH shows the use of curves to achieve harmony, flow and beauty in the overall design. Recently, our resident patio and hardscape expert shared some of his thoughts on the fundamentals of hardscape design. Rob Mitchell is our patio and hardscape expert and is truly a craftsman. He shared with me the basics that go into creating a magical outdoor space, and also the key elements that need that go into the recipe for aesthetic appeal, good function and convenience. In many instances our customers bring some of their own ideas to the table, Rob is able to take these ideas and translate them into the design in ways that are quite impressive. In design, every space is different, and should be treated as such. We like to see something develop and enjoy working with homeowners through the entire process. No stone is left unturned when we prepare your architectural rendering. The initial thing we try to do with the design of each outdoor structure is to create a grand entrance into the structure, or a grand entrance exiting the structure. This goes back to the old cliché’ that ” first impressions mean everything”. This could not be more true, the first impression sets the tone and expectation for the design in its entirety. We usually achieve this through the staircase that leads you into the structure itself. We use a great deal of arc and tangent design that incorporate the use of curved lines. Curved lines soften the back of your home, are more intriguing than straight lines, and offer more opportunities within the design to serve specific function. For instance, using curves and circles within the areas that you wish to designate for living and conversation areas versus dining areas. The decks from the past were squares and rectangles, using arc and tangent leaves more room for open creativity and lends the design to connect the curves with no flat spots so the design is seamless and continuous. Arc and tangent promote flow and harmony as you move from one structure to another, or from each area of designated function into another. Circles and curves are more relaxed and easier and more visually appealing to connect to. Design statements can also be made through the use of colors and textures. Most of the time our customers allow us to pick the colors. In general, with patios and hardscapes, earth tones are very popular right now. We are seeing a trend towards the use of larger pavers with natural stone texture, similar to a rock texture on the top. One of the ways in which we like to add drama to our hardscape designs is to change direction in which we lay the materials for our patios. Often times, we will lay the pavers soldier course around the patio and have a 45 degree angle. This spices the design up a bit. We also like to use seating walls with lighting and banding. The use of retaining walls and planters blend especially well with a patio/deck combination structure because it adds height without creating a stark contrast. Thinking “outside the box” , by using arc and tangent when it comes to outdoor living designs offers more flow and harmony within the structure itself and makes it a joy to look at as well. 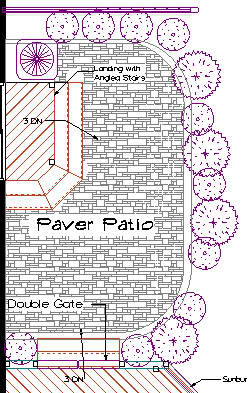 This paver patio design shows the way in which we use arc and tangent. We are also building a large number of outdoor fire pits and fireplaces to partner with our deck and patio combinations. Letting Archadeck of Columbus design a custom feature such as this promotes continuity of the custom feel and we can pull accents from your home to make it a cohesive design. Rob said, ” if he won the lottery himself, he would build a deck/patio/outdoor fireplace combination in his own backyard.” This speaks volumes on the impact adding an outdoor fireplace or fire pit can make in your own backyard! The only thing we would like to see people do more with is integrated patio lighting. Good lighting creates an ambiance, not necessarily in areas that it would perform function, but to create more mood. Adding light to areas such as risers in stairs, beneath seating walls, or even as a banding in the border of a patio will create mood. Unilock pavers actually offer a glowing luminescent paver to use in borders or as banding, it is not cheap, but the effect is well worth the cost. See more of our patio and hardscape designs and outdoor fireplace and fire pit designs by visiting our patio and hardscape gallery, and our outdoor fireplace and fire pit design gallery, both located on our website.